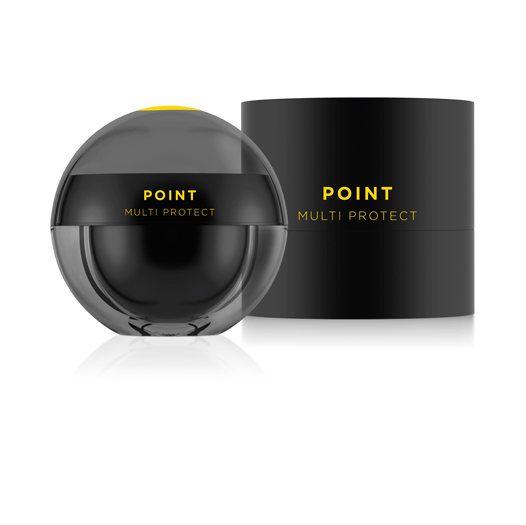 POINT MULTI PROTECT is a peptide-infused anti-ageing moisturiser with sun protection factor 15. Formulated for delicate skin or skin affected by environmental stresses. A biomimetic peptide that reduces UVB-induced inflammatory response for optimal skin protection. With excellent antiinflammatory activity, hence preventing neurogenic inflammation which is linked to photo ageing offering a great potential in preventing the signs of premature ageing of the skin. Acts as an anti-pollution agent. It can neutralize the negative effects of Particulate matter (PM) including collagen degradation, overproduction of melanin and inflammatory processes and help protect skin cells from daily environmental aggressions. It protects from the appearance of wrinkles and dark spots, and protects from inflammation. It helps restore skin balance. Its capacity to stimulate sirtuin-1molecules results in the activation of epidermal differentiation while regulating inflammatory reactions. Contains proteins, glycoproteins and polysaccharides isolated from soybeans. By stimulating synthesis of extracellular matrix constituents and providing comprehensive photoprotection, Phytosan counteracts the signs of biological and UV-induced premature skin ageing (such as formation of wrinkles). Also known as mucopolysaccharides these are a fundamental component of skin tissue, essentially a group of complex proteins. Chondroitin sulfate and hyaluronic acid are part of this ingredient group, all of which function as skin-replenishing and restoring ingredients.